The big news for the 2018 Ford F-150 this Spring has been the arrival of their all-new 3.0L V6 Powerstroke turbo charged diesel engine. Delivering just 250 horsepower, it kicks out a whopping 440 lb.-ft. of torque that – coupled with the new 10-speed automatic transmission – can haul up to 2,020 pounds and tow up to 11,400 pounds. With its new engineering and Start/Stop technology, it delivers up to 30 mpg on the highway. 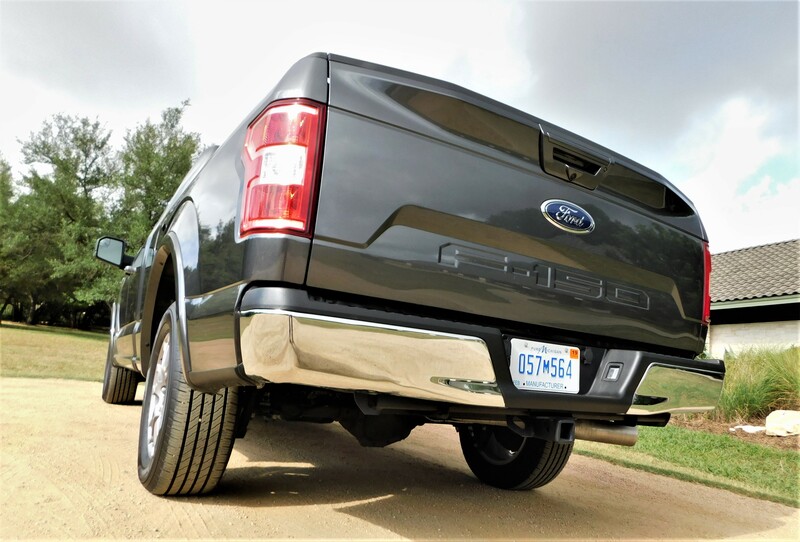 Stealthy quiet and smugly powerful – but also pretty expensive – were the 3.0L Powerstroke turbo diesel powered Ford F-150 King Ranch and Platinum SuperCrew 4x4 pickups we tested at the media launch in Denver a few weeks back. Delivered prices on the several we tested ranged from $60,000 to $66,000. Not everyone wanting an F-150 with the new Powerstroke turbo diesel is in a paygrade to afford one of those. 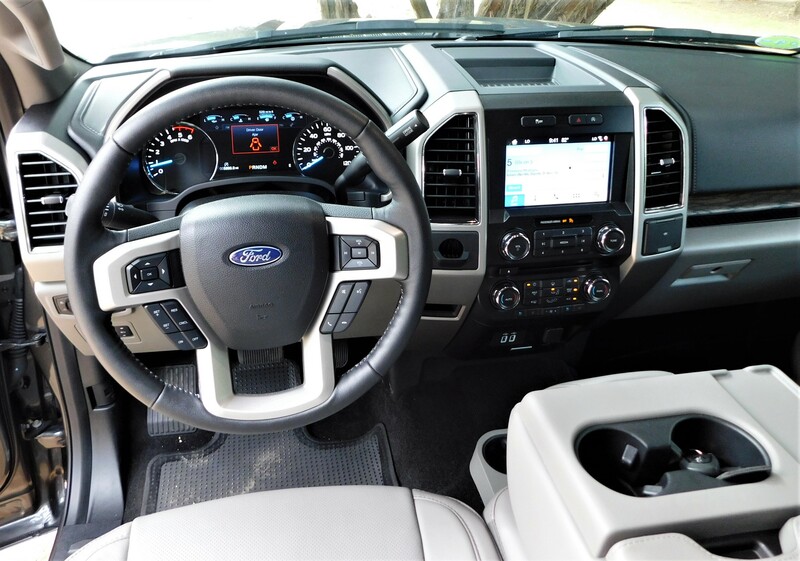 To address that, Ford offers the popular Lariat SuperCab 4x2 with the Powerstroke powertrain. Well-equipped also, it’s MSRP (with the diesel) is $45,105. Not only is the price point more attractive, but all of the capability and features included make the Lariat version a very fine truck for middle range buyers. 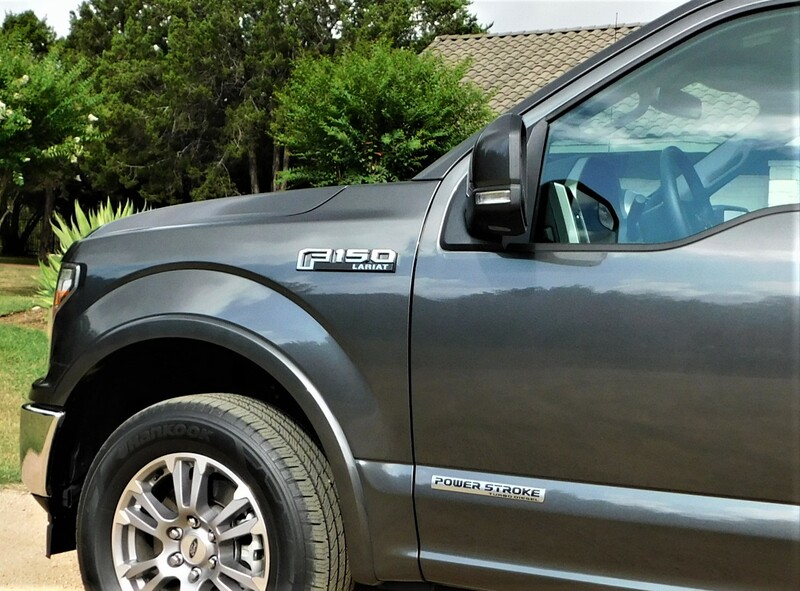 We recently tested the F-150 Lariat 4x2 SuperCab Powerstroke diesel in and around Austin, Texas. 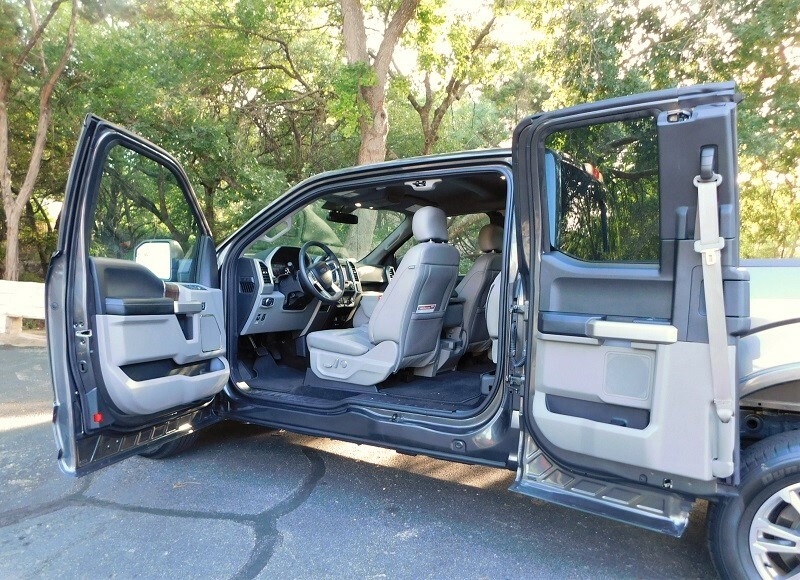 Our test Lariat 4x2 SuperCab came in a deep, refined Magnetic color with Medium Earth Gray leather interior and Woodgrain-style accents. 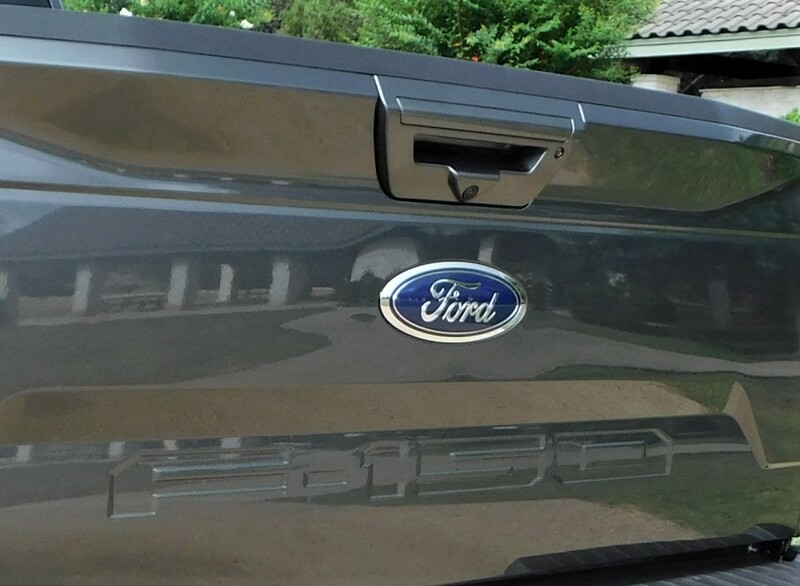 Except for the subtle Powerstroke badging, it looked just like any other F-150. As with the King Ranch and Platinum versions, this Powerstroke was exceptionally quiet. 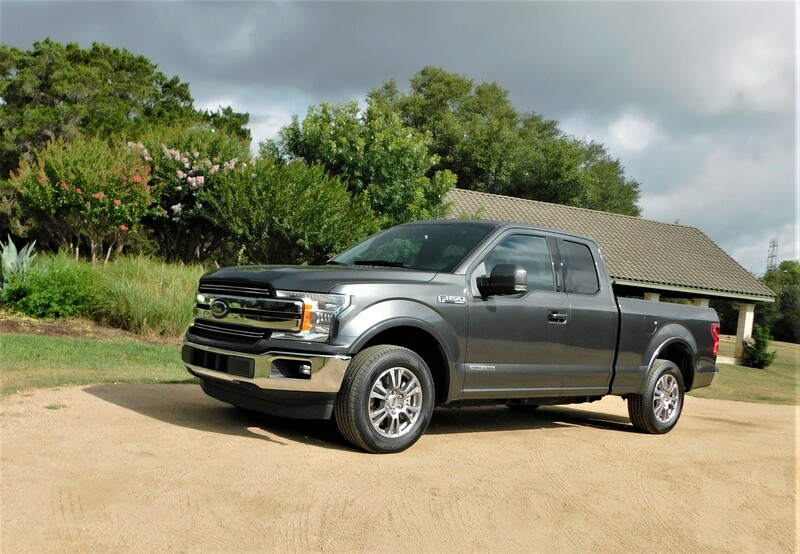 It was only in the company of veteran truck owners that the question invariably came – “is that the new Ford F-150 diesel?”. 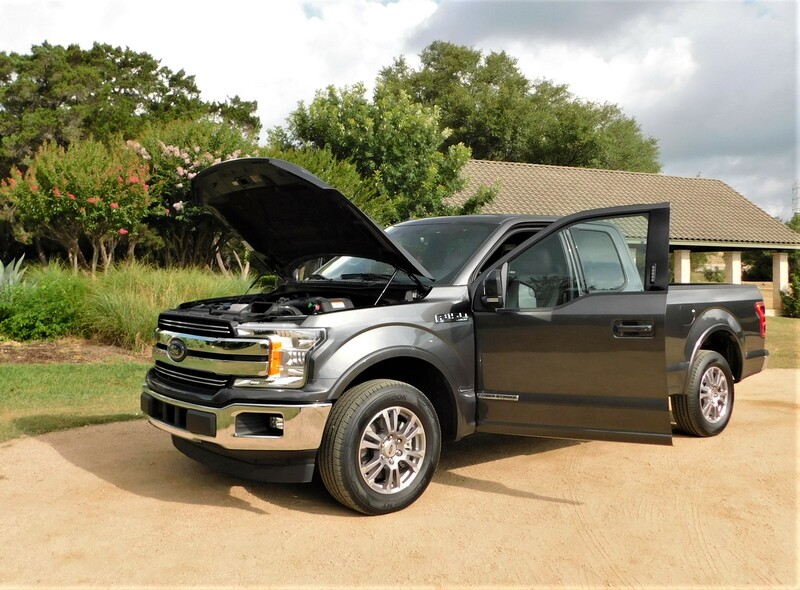 Our test F-150 Lariat 4x2 SuperCab’s 3.0L Powerstroke V6 was equipped with Auto Start/Stop and mated to the Ford 10-speed automatic transmission with manual shift and Tow/Haul, Snow/Wet, EcoSelect and Sport modes. As noted before, the Stop/Start feature is pretty unobtrusive, but there is a button to disable it if you want. By the numbers, payload on this Lariat 4x2 SuperCab (6-1/2- foot box) was 1,852 pounds with tow capacity of 10,100 pounds. Fuel economy was estimated at 22/30 mpg city/highway and 25 mpg combined. With its 26-gallon tank, highway range is over 700 miles. Built from the – also popular XLT – the Lariat is loaded with features and functionality. 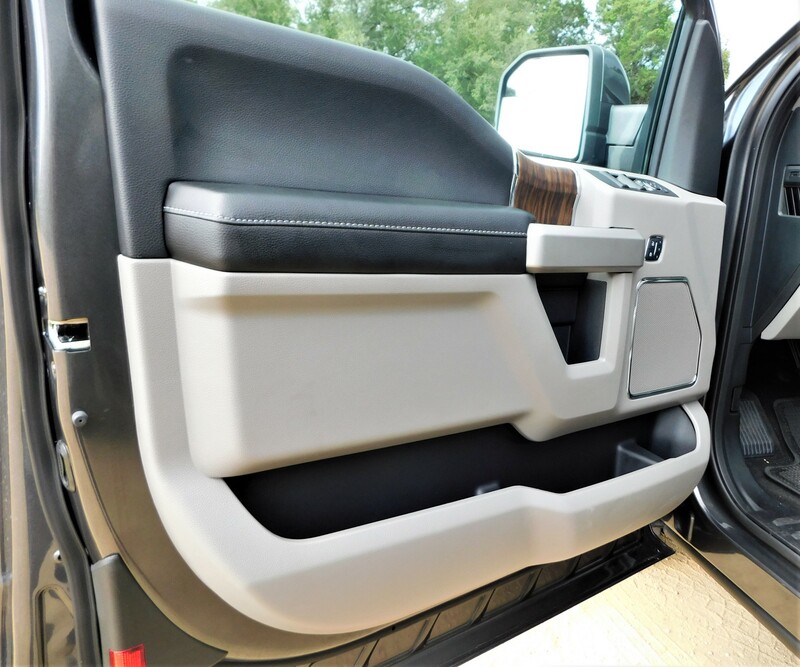 Of special note on our SuperCab were the 170 degree opening rear doors that can lay flat against the bed to enable easier access to the second-row cargo/people space in tight circumstances. 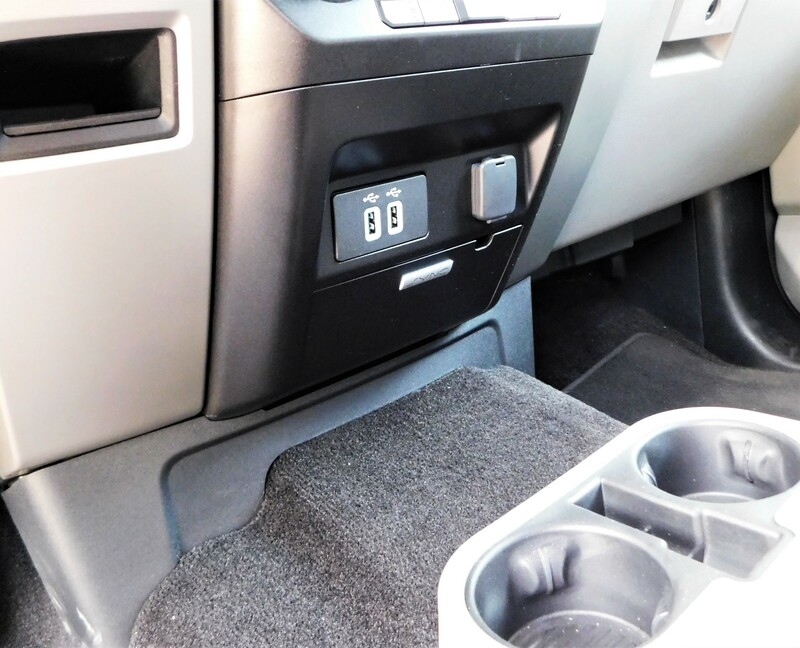 Also a hit with my partner were the Power Adjustable Pedals with memory, grab handles front and rear, ambient lighting, accessible cupholders and power points front and rear. The handsome exterior features Halogen Headlamps and Foglamps, automatic on/off headlamps with wiper activation, Intermittent Windshield Wipers, Daytime Running Lamps, Front and Rear Chrome Bumpers, Body Color Fascia and Chrome two-bar style Grille with Black Surround and Background Mesh, Heated Power Folding Side Mirrors with Integrated Turn Signals and LED Approach Lighting and 18-inch machined aluminum wheels with Flash Gray pockets mounted with 265/60R18 All-season tires. 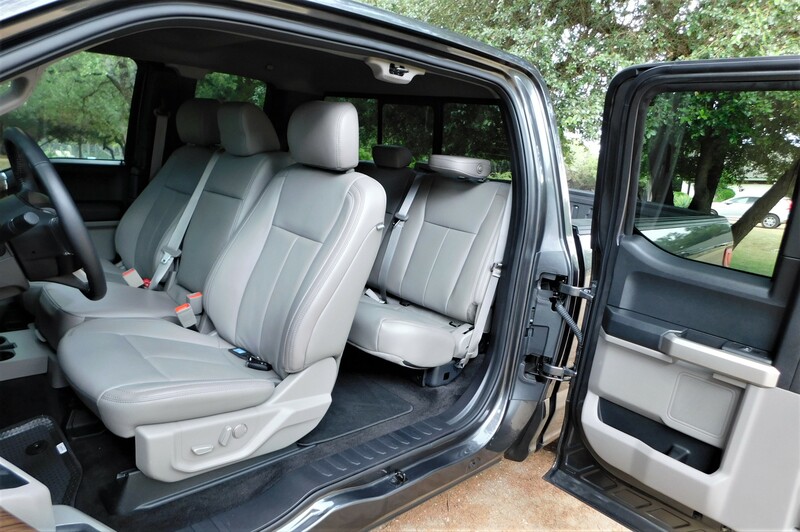 On the inside are heated and ventilated leather-trimmed 40/20/40 front seats with fold down console and 10-way power driver and passenger adjustment. 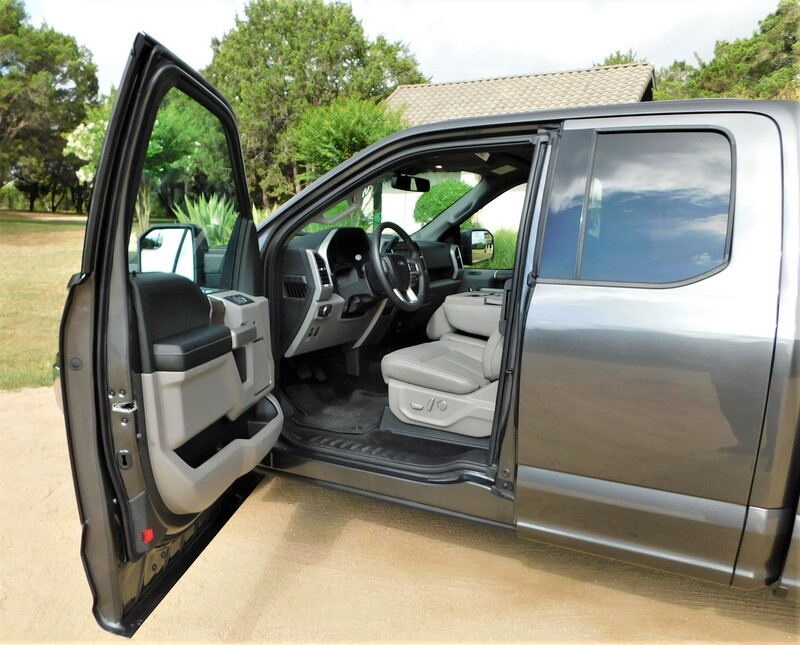 Also found are Electronic Dual-zone temperature control, Sync 3 w/Intelligent Access and Push Button Start, 8-inch Center Stack Productivity Screen, SiriusXM Satellite Radio, Remote Keyless Entry and Rear Window Power Sliding Glass. Other key features include Tire Pressure Monitoring, Cargo Lamp, LED Box Lighting, Box Cargo Tie-downs (4), Spray-in Bedliner, Tailgate LED Light, Tailgate Power Lock, AdvanceTrac with Roll Stability Control, Rear-View Camera with Dynamic Hitch Assist, Trailer Sway Control, Class IV Trailer Hitch and more. With delivery, our mid-range Powerstroke Turbo Diesel equipped 2018 Lariat 4x2 SuperCab – priced at $46,905. 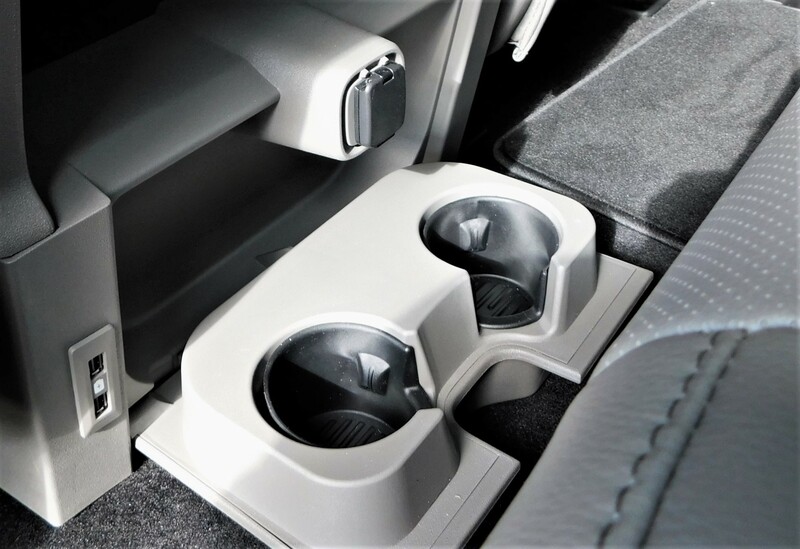 As many of you know, we often add some items to configure a vehicle like we would have bought it. We offer a few that would have enhanced its trailering capability. 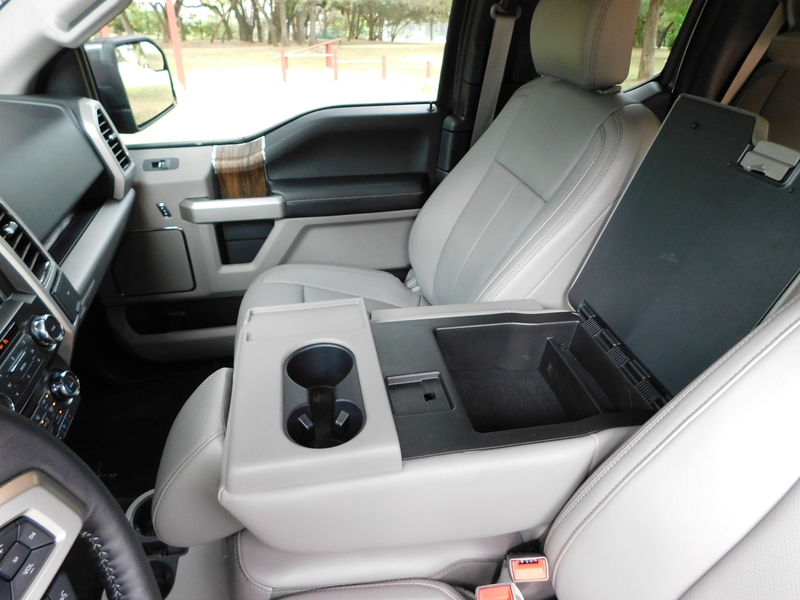 Lastly, we noted an unusual but interesting accessory – an In-Vehicle Safe Console Vault (located in the console) for securing valuables or other items for $795. If you are ‘toting’ personal protection, you might want to add one of these to your Lariat. As announced, the new Powerstroke turbo diesel is also available in the popular XL and XLT trims. But – only to commercial/fleet customers. 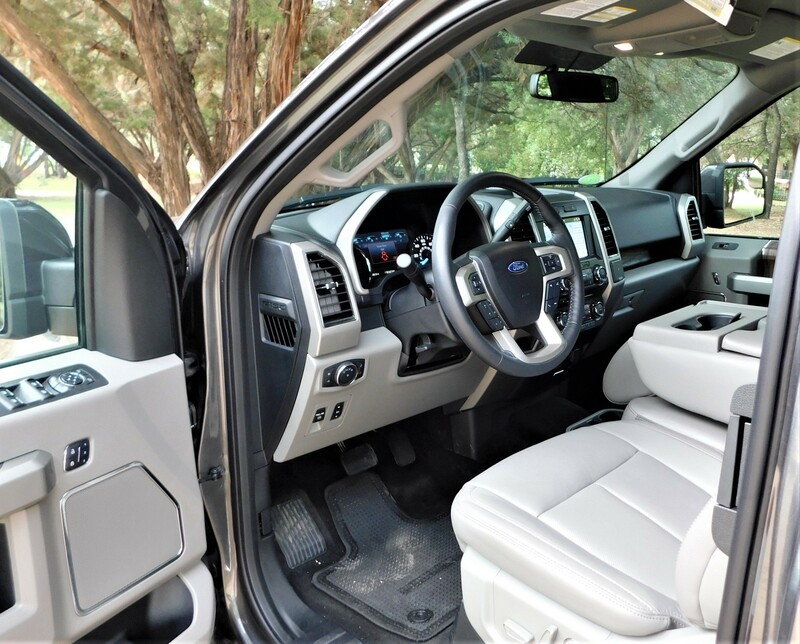 A Powerstroke Turbo Diesel powered XL or XLT should offer some serious competitive advantage for business users both large and small, but you need to be a Ford Fleet customer to get one. For more information on how to qualify as a commercial/fleet customer – contact the Fleet Customer Information Center. See their web site at https://www.fleet.ford.com/ or call them at 1-800-343-5338. Information Center. See their web site at https://www.fleet.ford.com/ or call them at 1-800-343-5338. We have been asked by many to compare the new Powerstroke to the EcoDiesel from Ram. Frankly, we like them both and find them very appropriate for their respective trucks. Performance data (shown below) slightly favors the new Ford Powerstroke while Ram offers more trim choices. Also note that Ram will not be offering the EcoDiesel in the new Ram 1500 for 2019. Our belief is that they have chosen to promote their new eTorque Mild Hybrid technology power plant in the place of the EcoDiesel with the launch of the new Ram 1500. We believe EcoDiesel will return the year following. Chevrolet is still promising their new 2019 Silverado will offer an all-new 2.7L In-Line Six-Cylinder Turbocharged diesel mated to a 10-speed automatic in Q1 2019. We do not have any performance or other market information at this time. With the Ram EcoBoost out for 2019, the diesel competition in full-size pickups will be between Ford and Chevrolet. Stay tuned, we will have more on this as the year progresses. For more information on the new Powerstroke F-150 trucks, you can read our “First Drive” report at http://www.inwheeltime.com/stealthy-quiet-smugly-powerful-f-150-power-stroke-v6-diesel-delivers/. The complete lineup of 2018 Ford F-150 pickups can be seen here: https://www.ford.com/trucks/f150/.